I've got so many things on my plate recently, so my WIP pile is huge! First off, I am excited to say that we will be moving to Houston at the end of May because Jeff accepted a job offer from Hewlett Packard. I can't wait to start this new chapter in our lives, but I wish I could put off all the packing and moving that is involved. 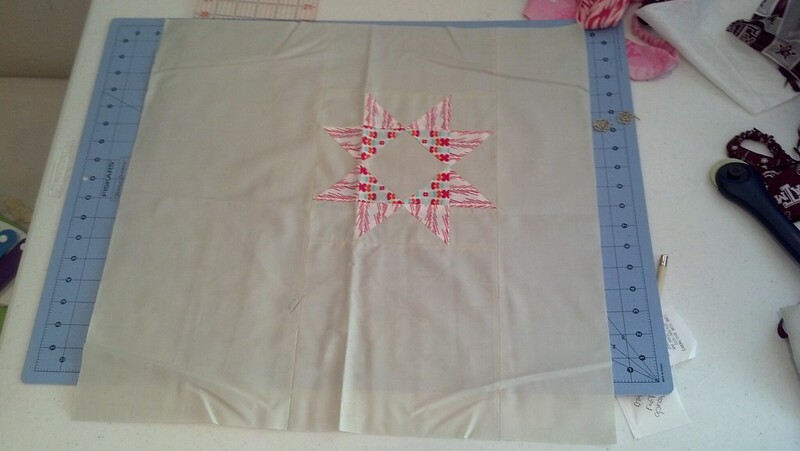 I'm really excited about how my Sisters' Ten BOM from Gen X Quilters is coming along. I got an amazing little fat quarter bundle from Pink Castle Fabrics. At first I was worried that the prints were a bit too girly, but I fell in love with them after I started playing around with all the fabrics. The blocks are all 12.5" unfinished. 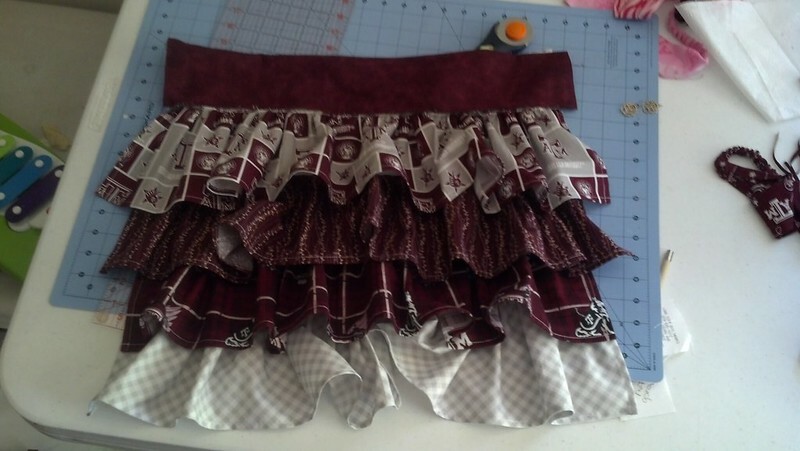 I'm also working on this super cute ruffle apron. It is the first one I have ever made, and I am liking how it is coming together. I just need to add the ties and it will be all done. 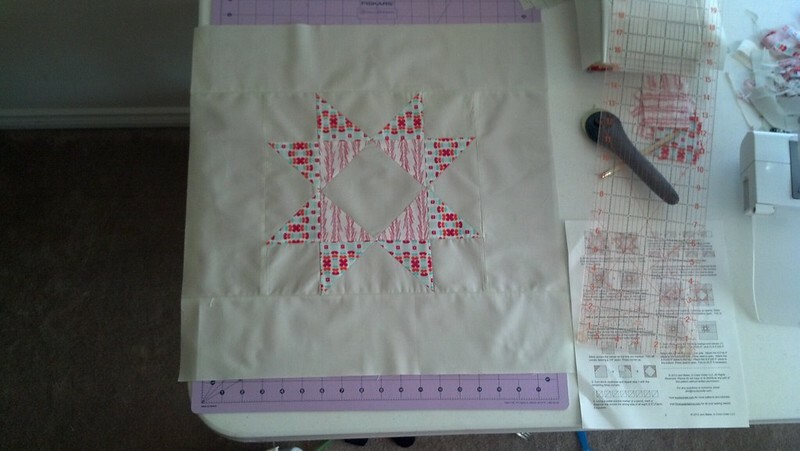 I'm also working on the Shining Stars BOM by Jeni Baker. 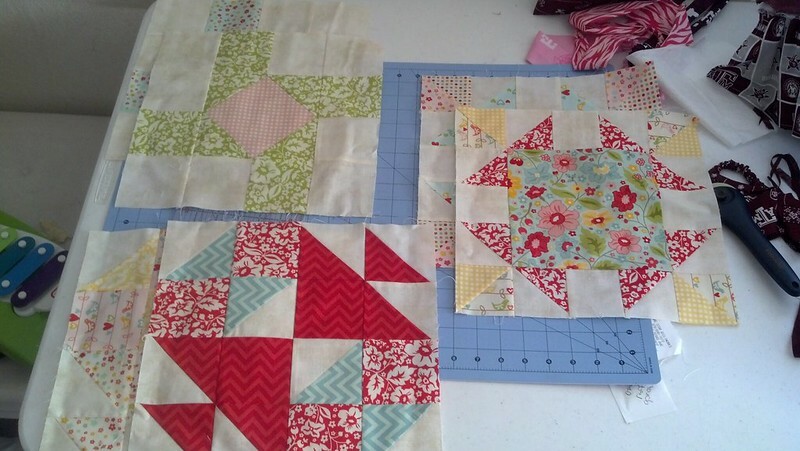 It is using her new Color Me Retro fabric line, and I am really liking how it is coming together.These two blocks were my first adventure into making flying geese. I need some work, but it was fun to try something new. I have two more big piles of inventory I am making for my Etsy shop. I am trying to get everything made, that way when I start to pack for our move it will all be done and in one box (hopefully). Your BoM blocks are looking great! Best of luck with the packing and moving! Fun blocks! At first I wasn't sure about the first photo, but it grew on me fast, the fabric and blocks are great together. How you have an uneventful move! Gorgeous blocks and the apron is super cute! Well; I must say for a young Mom....you are getting a lot of sewing in there...good for you. I loved everything; your blocks are gorgeous and that little ruffle apron is too cute. Good luck with your move. Your shining stars block is really pretty. Jeni Baker is in my quilt guild. Wow, it looks like you have a lot of great projects in the works. That apron is super cute.